Is the E on emigrant a typo, or is this really the last stop for Americans seeking to relocate to other countries? 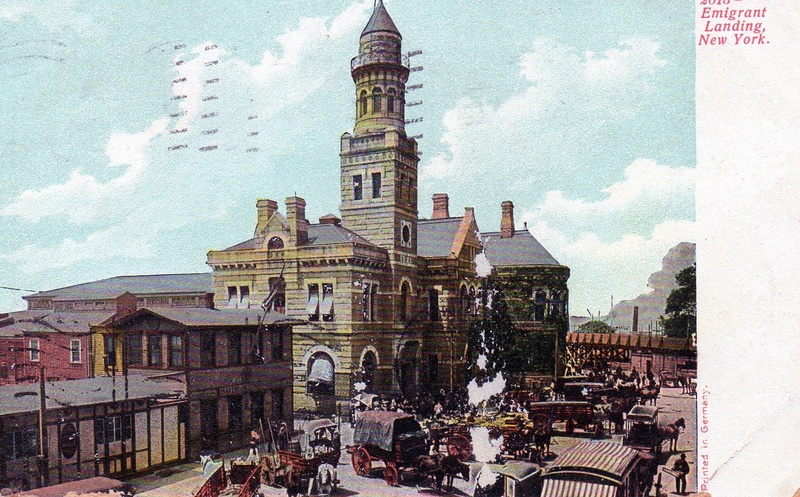 Sometimes the manufacturers of these vintage postcards shaved off details, but the building looks significantly smaller and less ornate than the main immigrant landing station on Ellis Island. 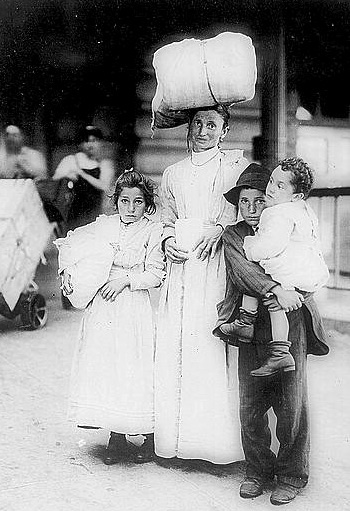 Getting through Ellis Island after arriving in America took some time. 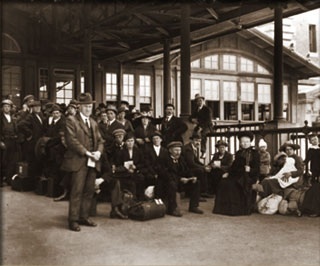 After disembarking and taking a ferry to the main building, every immigrant went through the same process. They would leave their belongings in a baggage room, undergo a medical exam, and be interviewed by agents to make sure they were legally able to come to the U.S. The routine took hours, days, or weeks, and not everyone was given the go-ahead to enter New York City. But if they did, America’s newest arrivals were free to move on. They went to a money-exchange area, collected their bags, and waited at the foot of the stairs of the Great Hall to reunite with family already in New York. One pillar in the room was the location of so many emotional family reunions, it became known as the kissing post. It’s marked with a plaque today. That’s quite a festive Christmas tree these Greenwich Village kids are posing in front of. 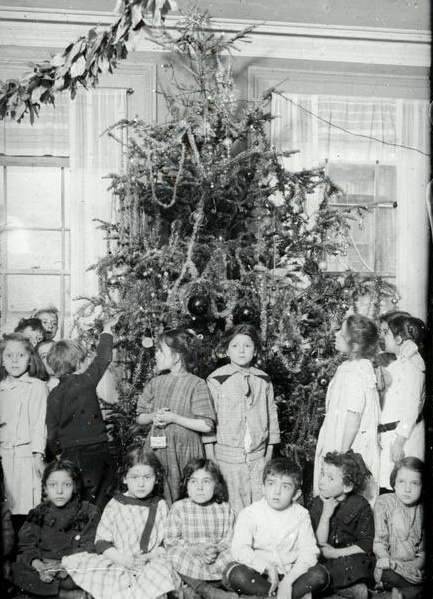 They’re celebrating the holiday at the Greenwich Settlement House, which still stands on Barrow Street today. The photo, from the New York Public Library, is undated. 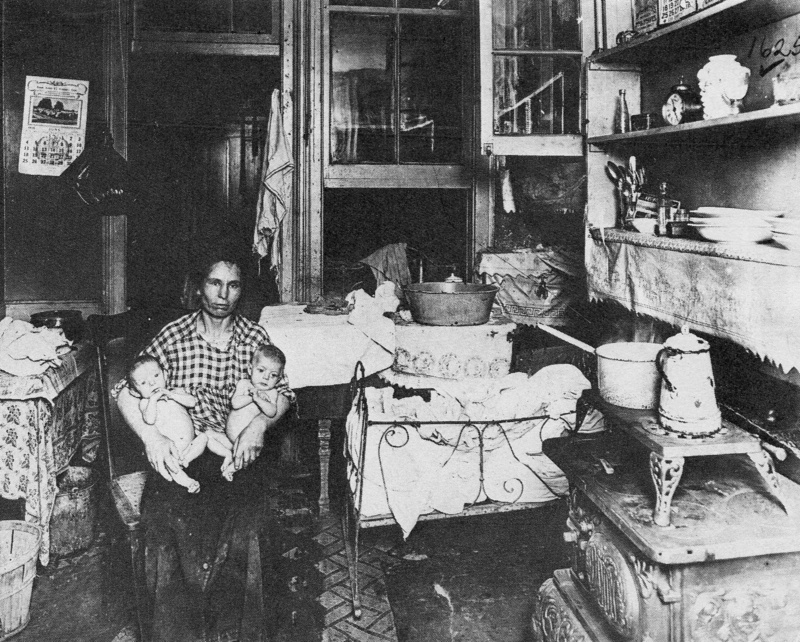 Looks like it’s from the early 1900s, when settlement houses popped up in lots of poor New York neighborhoods. They were funded by wealthy residents to help “settle” new immigrants by providing health care, job training, and art classes.